any compound dissolved in water can readily conduct electricity and undergo electrolysis. solid ionic compounds cannot undergo electrolysis. [me-17] The reactions in the blast furnace to produce iron are summarised by equations (1) to (4). The symbol equations may NOT be numerically balanced. [me-18] The reactions in the blast furnace to produce iron are summarised by equations (1) to (4). The symbol equations may NOT be numerically balanced. [me-19] The reactions in the blast furnace to produce iron are summarised by equations (1) to (4). The symbol equations may NOT be numerically balanced. [me-20] The reactions in the blast furnace to produce iron are summarised by equations (1) to (4). The symbol equations may NOT be numerically balanced. 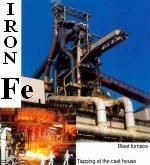 [me-21] The reactions in the blast furnace to produce iron are summarised by equations (1) to (4). The symbol equations may NOT be numerically balanced. Stages in the extraction of iron in a blast furnace are described below after iron ore, coke and limestone have been added at the top, but not in the correct order. ... Substance X is a hydrocarbon with a low boiling point. ... Substance Y is a hydrocarbon with a high boiling point. Substance X is a hydrocarbon with a low boiling point. Substance Y is a hydrocarbon with a high boiling point. Below is a list of processes involved in the petrochemical industry.